 Study: Drugs to treat urinary infections could cause heart, brain problems The new study is the first large analysis of antibiotic use in pregnancy. It found that mothers of babies with birth defects were more likely than mothers with healthy babies to report taking two types of antibiotics during pregnancy: sulfa drugs (brand names include Thiosulfil Forte and Bactrim) and urinary germicides called nitrofurantoins (brand names include Furadantin and Macrobid). Antibiotics During Pregnancy Increases Risk for Child Becoming Obese children who were exposed to antibiotics in the second or third trimester of pregnancy had a higher risk of childhood obesity at age 7. The research also showed that for mothers who delivered their babies by a Caesarean section, whether elective or non-elective, there was a higher risk for obesity in their offspring. Study Links Autism With Antidepressant Use During Pregnancy About 4000 families in the US have children born with major birth defects each year because of antidepressants taken in pregnancy. 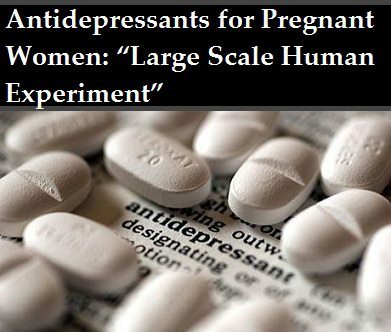 Up to 20,000 women per year have a miscarriage because of these drugs and a large number have voluntary terminations linked to antidepressants. 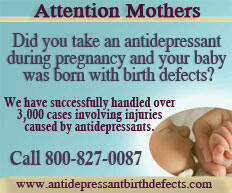 Miscarriages are among the biggest single predictors of later mental illness and substance misuse in women. In Europe these figures likely run at an extra 6000+ birth defects, 30,000+ miscarriages, and who knows how many extra voluntary terminations. Mother’s antibiotics can give baby asthma A comprehensive new study shows that taking antibiotics during pregnancy increases the risk of the baby developing asthma by an average of 20 percent...Backed by the new findings, Stensballe believes that doctors should think twice before prescribing antibiotics for pregnant women.